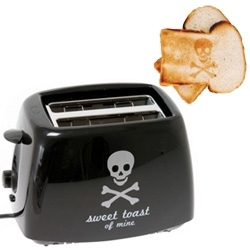 A toaster that puts a skull and crossbones on your toast. Must have. Speaking of which… do you know what a pirate puts on the toast? MARRRmalade. I love you, and I love that toaster! I found it from Dave Barry’s blog, even though I read mainly for the squirrel terrorism updates. This is today’s happy post. I’m happy now. This reminds me of the slogan that once graced the sides of Clinton’s Bread delivery trucks. Mind you, this super healthy, whole grain Utah product was around long before Bill Clinton became a household name. The slogan read, “The whiter the bread, the sooner you’re dead.” One of the white bread companies sued and they ended up removing the slogan. Of all the ones I’ve seen (Cinderella toaster with image of slipper, Hello Kitty with said logo on toast…)… this is the KOOOOOLEST! If you end up getting that, I will have toaster envy. I just may have to come & visit you solely for the toast. Well, and seeing you guys would be a nice bonus. I LOVE IT. I want pirate toast!!!!!!!!!!!!!!!!! I would burn it on purpose and hang it on the wall though. that’s the awesomest thing i’ve seen today. Krispy stole the words out of my mouth. when i want to avoid stuyding i stalk everyone’s blogs and yours is always super good to read. and THIS post is the BEST! please get this toaster and show us all the amazing toast you make with it! That made my day. I can go around and have a silly grin thinking about that. Previous story Let's talk double-dipping.